Happy April 1st! Before you read on, I feel the need to state that what I’m about to write about is not an April Fools joke! I wish I could say that it was, but it isn’t! Would you eat road kill? How about a hamburger made with a combination of euthanized cats and dogs? A few days ago, I listened to a fantastic speech by Howard Lyman aka The Mad Cowboy. He enlightened me on a few other ingredients that I didn’t know were fed to the animals. I knew that feeding grounded up cows to cows had become outlawed – thanks to “Mad Cow Disease”, but when he informed his audience that the practice of feeding roadkill and euthanized animals to factory farmed animals is still common practice I was thoroughly disgusted! I mean, once upon a time I was eating this …. ! Then I started thinking, well some of these euthanized animals could have cancer – hence they’re being put to sleep – and now their remaining bodies are being fed to livestock!? By the way, this practice isn’t just happening here in the United States, for those of you reading this across the globe thinking you’re in a “safe zone”! This is, according to Howard Lyman, “common practice” in the meat industry! 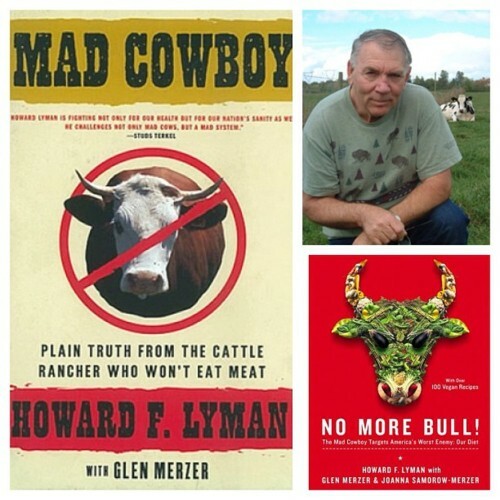 Mad Cowboy aka Howard F. Lyman – A Truly Remarkable Man! Most of the things livestock eats is not what is natural to them! And what they eat – ends up in “our” bodies! (No longer mine because I stopped eating them!) This does not even take into account the pain, suffering, and stress that these poor animals also have to endure before they end up on someone’s plate! Is it any wonder we are a stressed out, in pain, and sicker than we’ve ever been Nation and world? A world that is suffering for what reason, I have to ask? We don’t need to eat their bodies to be healthy and strong – that is one giant myth! The animals are given huge amounts of antibiotics to stay alive in their horrible confinements in Factory Farms. 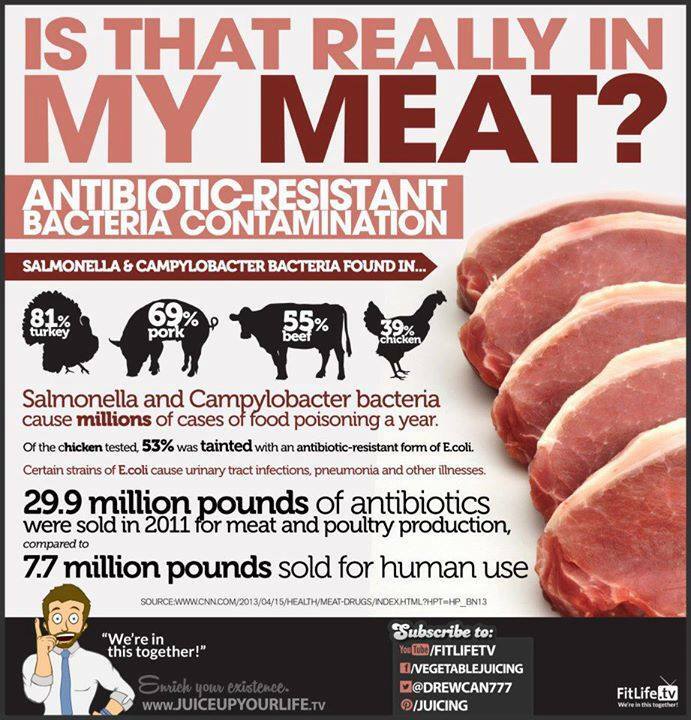 Antibiotics also makes the animals grow bigger – hence more profit for the company selling them! Well, it begs to question then, if it makes the animals grow bigger – then what about us? Do people who eat the animals with all those antibiotics and growth hormones/steroids grow bigger too? The answer is “YES!” We’ve all heard the saying, “You are what you eat!” Food for thought, for sure! Antibiotics – making the animals bigger…and us!? Again, I’ve said this before, there’s a better way to eat and go about this! 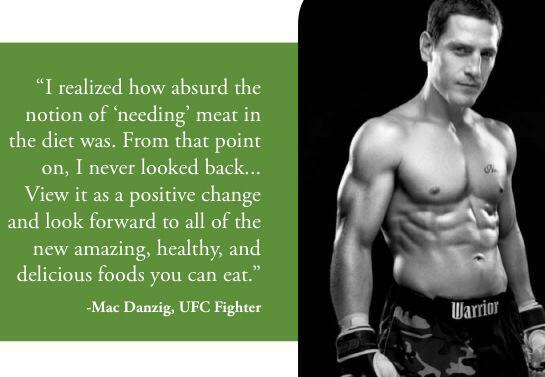 Some of the UFC guys have already come to this realization! The world is truly awakening to a better way of eating and thriving! And with that statement I will close for today! Below is the link to the speech by Howard Lyman. This is very similar to the speech that I listened to in my nutrition program. Howard is a brilliant speaker! I would love to shake hands with this man one day! Enjoy and Happy Spring! Thank you for your post on this very important and rarely spoken about subject matter. I did not know about the feeding of dead cows and euthanized pets to cows, but it is not one more reason I am thankful for not eating meat or dairy any longer. Thank you also for sharing the Howard Lyman talk. It was a very educational talk in front of law students here in Seattle. I had never known what happened in the law suit that Oprah was involved in, so I really enjoyed learning about that as we are now seeing more and more people being sued for telling the truth about animal abuse, such as Mercy for Animals undercover reporters. The chill effect limiting the free speech is very real as well. Even if a corporation doesn’t get any money or a win from the people they sue, the fact is that the corporation can keep them in court for years upon years, like they did to Howard Lyman, preventing the individuals from working, depleting their funds in legal costs and make their lives living hells. I would imagine than the fact that such harassment is allowed by the legal system would keep a lot of people from speaking of what they know to be true. This should be no exception! Thanks for reading, replying and watching! Cheers! Thank you, Sherry! I’m glad that you could find something to learn! Personally, I take the opposite approach, meaning, I look at everyone that I “meet” as my teacher! I often learn new things by reading what someone else is thinking! I love it if someone can give me a new perspective on something that I had previously thought. That’s the beauty of sharing information! We are all here to learn from each other! Thanks again for the compliment!